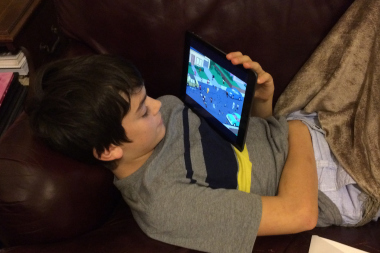 Ever wondered if all that screen time is negatively affecting your child’s brain? Bad news, I am afraid. According to all the experts, this electronic screen syndrome (ESS) is causing sleep deprivation, social isolation, behavior problems, and a hyper aroused nervous system. Some pediatricians have estimated that up to 80% of the kids, they are seeing who are being medicated for ADHD, anxiety, depression and mood swings do not have these disorders at all. There are simpler remedies like reducing screen time, for example. The American Academy of Pediatrics guidelines on cutting down screen time (at present a whopping 7 hours a day) is listed here. Parents and teachers have noticed how too much screen time is making kids surly, bored and are permanently “wired and tired”. But what is actually happening to the child’s brain? Researchers have shown that the frontal lobe development is actually being retarded by all this screen time. This is the part of the brain, which is responsible for the child’s attention span, controlling emotions and empathic skills. Staying connected may mean that your child is becoming disconnected from real life! Let us look now at how screen time is affecting your child’s brain. The best way to get a child to talk is by interacting and talking to him. The kid can watch the facial expressions, smile, hear the tone of voice, experiment with the sounds and notice the body language. All these are essential and complex processes in learning to talk. No screen, game or video can replace the joy of learning from human interaction. A robot might, but let’s not go there! Did you know that a parent uses 940 words an hour when chatting to a toddler? Guess what happens when the TV is on. The number of words the parent uses falls to 770. That means the toddler is learning fewer words over time. There are lots of studies that show that a sedentary lifestyle is bad for a child’s or teen’s physical health. One study shows that watching more than 2 hours of TV a day led to poor physical fitness, lower self-esteem and poorer academic achievement. There are innumerable factors such as the home environment, social economic status and school, which can also negatively impact a child’s development. But one inescapable fact is that too much screen time is preventing our kids from doing sports, reading, playing outdoors, and talking (and fighting!) with siblings. Reducing screen time is one suggestion which does not cost you a cent. At the worst, nothing will change, although it is difficult to imagine that things might be worse. An excellent book to help you actually carry out this Reset Your Child’s Brain: A Four-Week Plan to End Meltdowns, Raise Grades, and Boost Social Skills by Reversing the Effects of Electronic Screen-Time by Dr. Victoria Dunckley. She recommends that parents implement a strict electronic ‘fast’ just for a few weeks. There can be a dramatic improvement in sleep quality, mood, focus and behavior. Many parents will recoil from the idea of having to stop their children using cell phones and laptops for a while. The book is full of practical suggestions on how doing this. The rewards are well worth the initial effort and struggle.